Values-based schools seek to promote an educational philosophy based on valuing self, others and the environment through the consideration of an ethical values vocabulary. Values are principles that guide behaviour. At Fielding, adults are encouraged to model values and to give time for reflective practices. We believe that this empowers individuals to be effective learners and good citizens. Our Values-based education philosophy underpins our work to actively promote fundamental British values of democracy, individual liberty, mutual respect and tolerance of those from all faiths, backgrounds and cultures. A rounded programme of assemblies and events promote children's spiritual, moral, social and cultural development, enabling them to develop their own moral and ethical compass to guide what is right and what is wrong. To support and further develop our children’s Values education we now a set of four core values that be the basis and underpin the teaching of all other values. These four core values are respect, resilience, empathy and reflection. Our MindUp curriculum teaches social and emotional learning skills that link cognitive neuroscience, positive psychology and mindful awareness training based on neuro-science. Pupils learn about the brain, their emotions and the benefits of reflective practices resulting in self-regulation of behaviour and the ability to mindfully engage in focused concentration required for academic success. Our MindUp and Values curriculums will be further linked to strengthen children’s understanding. From April 2019, we will be focussing our Values- based Education on teaching and modelling four core values. 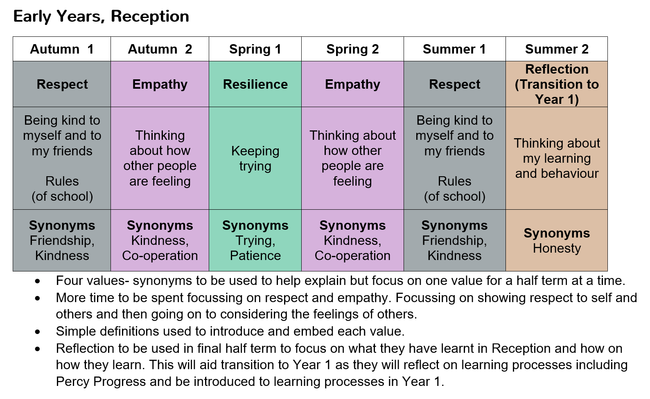 These values will be the basis of all our values teaching and will help children understand connected values. 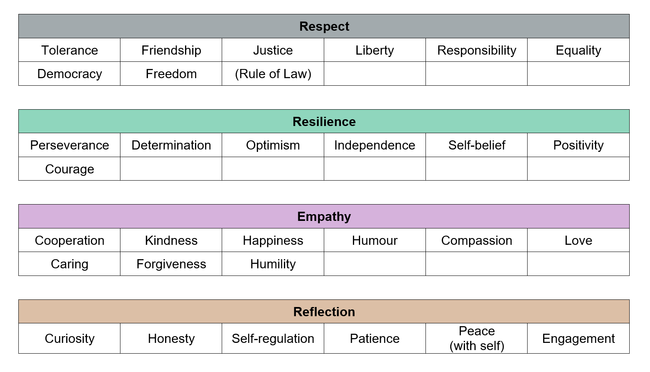 These Values have been chosen by carefully observing and discussing which of our previous values have worked well and which ones would develop children the most morally and educationally. The approach to our values and which ones are covered will be differentiated by age. The focus is ensuring a basic understanding on the value, then widening the understanding of super values by connecting with similar values. The focus with every value is what the value looks like to us and how it looks in action. Teaching of values will be cyclical to ensure depending of the understanding of that super value. We will develop a deepened understanding on values by spending longer on them in Early Years and key-stage 1 and then teaching values connected to super values in key-stage 2. This deepened understanding means children will understand how these Values can be shown personally, socially, educationally and globally. At Fielding we have created the Fielding Values Baccalaureate where the children can use their Values in their wider school, home and local community. This empowers the children to take their Values learning and apply it in a range of ways. Last academic year, the members of the Values Action Group , which is made up of students from Years 4-6, worked together to adapt the existing Values Baccalaureate to create a new tiered system. There are now three levels of the Baccalaureate, which the children can earn across Years 4-6. Children, who have previously earnt the Values Baccalaureate, have achieved the Bronze level and should now progress onto the Silver level and then finally the Gold level. The new levels mean the children can apply their Values ethos and learning over longer periods of time and in a rage of situations. Children need to complete the task cards and provide the evidence as explained on the task cards. At Fielding, our values are a framework for living and learning. We equip our pupils with the necessary skills to be the best possible people they can be. Using the fundamental British values of: Democracy, Rule of Law, Individual Liberty and Mutual Respect and Tolerance; our pupils are prepared for life as citizens of the United Kingdom. Watch the video to hear Dr. Neil Hawkes, international consultant for values-based education, explaining the approach.